In 1999 Kapustin wrote three short compositions for cello and piano, Elegy, Burlesque and Nearly Waltz. 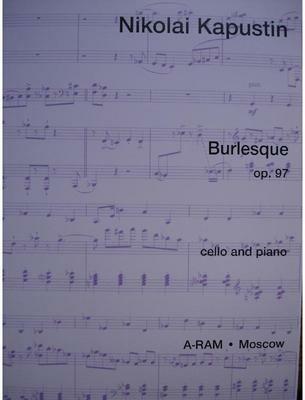 The Burlesque is a jolly piece, starting with two lines of solo cello music (arco), which switches to pizzicato as the piano picks up the theme. The work parodies contrasting styles, abruptly juxtaposing a jazz idiom with a lyrical, romantic line, all the time displaying a great sense of humour in this frequent exchange. Towards the end a teasing dialogue ensues between cello and piano as they toss the jazz theme back and forth. What do you want to know about Burlesque op 97 by Nikolai Kapustin?